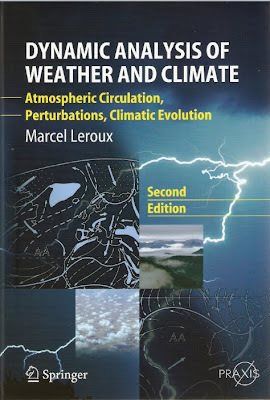 Foi agora publicada a última obra de Marcel Leroux «Dynamic Analysis of Weather and Climate». Acabou de a escrever dois meses antes do seu falecimento, que ocorreu em 12 de Agosto de 2008. Praxis Publishing is to be praised for its initiative in taking on the second English edition of Dynamic Analysis of Weather and Climate, thereby bringing a major work to the world’s notice. It was Marcel Leroux’ lifelong aim, pursued with steely determination even in his last days, to understand, and thereby to increase the understanding of others. As both geographer and climatologist, he knew that true understanding goes beyond our comprehension of tables and statistics; it involves thorough research into the complex web of facts about the interactions of the atmosphere, the oceans and the features of the land. His respect for nature in its entirety was founded upon real observation, the indispensable basis of scientific research to any student of the natural world. Leroux fosters understanding through the clarity of his explanation, solidly supported and encompassing the whole of the domain under scrutiny: the mark of the effective teacher. I would like to recall here, having witnessed it at first hand, the constant care that Marcel Leroux lavished upon the students, in particular the many who were preparing their theses under his guidance. In his research, as in his teaching, Marcel Leroux was a great man. Charles Toupet, Emeritus Professor Université Jean Moulin Lyon III. Part III – Dynamics of Climate: Climate Evolution, The “Global Climatic System”. A Bibliografia contém cerca de 500 referências de livros, revistas e blogues, entre os quais está o Mitos Climáticos (MC). O editor do MC fica profundamente reconhecido ao Prof. Marcel Leroux pela distinção. A leitura deste livro permite apreender como se processa a circulação geral da atmosfera tal como se observa nas imagens dos satélites e o que são os anticiclones móveis polares (AMP) e quais são as suas características. Para um diagnóstico exacto do cenário da dinâmica do tempo e do clima que se analisa – em qualquer época – Marcel Leroux explica os dois modos básicos da circulação geral da atmosfera: o modo lento e o modo rápido. É assim que facilmente se percebe que o modo determinante dos dias de hoje é o modo rápido: AMP potentes e frequentes em todas as épocas do ano, seja Inverno ou Verão. Nesta perspectiva, de carácter científico, porque baseada na observação e nos factos, o hipotético “aquecimento global” fica reduzido a uma fantasia.